Germany is holding federal elections at the end of September. The uncertain outcome of the elections as well as the potential impact of other events on the Eurozone political calendar may lead to an increase in business failures in Germany. German suppliers are some of the least likely of the suppliers surveyed in Western Europe to offer credit terms to B2B customers. This aversion to selling on credit is even more pronounced when selling to foreign buyers. 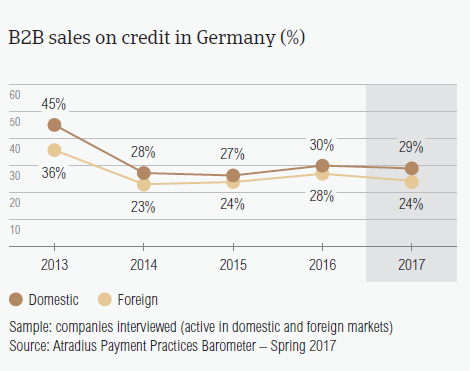 After a small increase in B2B transactions on credit observed in our 2016 survey (domestic: 29.9%; foreign: 27.9%), there has been a reduction in the percentages of sales made on credit in Germany in 2017 (domestic: 29.2%; foreign: 23.9%). The averages at country level are notably lower than those of Western Europe (domestic: 42.6%; foreign: 35.1%). Across the Western European countries surveyed, there is a uniform tendency to offer trade credit to domestic B2B customers more often than to foreign B2B customers. Germany is no exception. In 2017, domestic B2B customers of respondents in Germany (29.2%) are far more likely to be offered credit terms than foreign customers (23.9%). Together with respondents in Austria (26.5%) and Switzerland (28.0%), German suppliers seem more inclined to sell on terms other than credit terms. Respondents in Germany (92.4%) reported late payments from their B2B customers more frequently than their peers in Western Europe (87.8%). Compared to one year ago, fewer respondents reported that they experienced late payment from their B2B customers (Germany: 93.1%; Western Europe: 88.5%). Late payment of domestic and foreign invoices is reflected in the Days Sales Outstanding (DSO) figure posted by German respondents. In 2017, this averaged 25 days (eight days shorter than in 2016), the lowest in Western Europe and markedly below the 44 days regional average . This may suggest that among the Western European countries surveyed, German respondents are the most efficient in collecting payment of high value invoices. Slightly more respondents in Germany (63.5%) than in Western Europe (62.9%) said that they don’t expect a change in their annual average DSO figure over the next 12 months. Of those expecting a change, 24.1% foresee a slight increase and 8.8% a slight decrease. Average payment terms in Germany are some of the shortest in the region despite the two day increase observed in our 2017 survey. The average payment delay of B2B domestic and foreign customers of respondents in Germany increased compared to last year. Payment terms extended to B2B customers by respondents in Germany average 24 days from the invoice date (up from 22 days in 2016). Despite the two day increase, payment terms in Germany are very short compared to those extended in Western Europe overall (32 days). Next to Great Britain (23 days), the Netherlands and Denmark (each with 24 days), Germany offered the shortest payment terms in the region. This underlines a very strong emphasis on swift invoice payment. In 2017, domestic B2B customers were given shorter payment terms to settle their invoices (22 days) than foreign B2B customers (26 days). 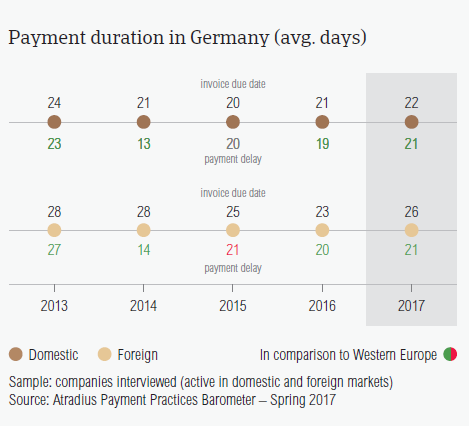 There was a modest increase in average payment delays: domestic B2B customers of respondents in Germany payed, on average, two days slower than in 2016 while foreign B2B customers paid one day slower. 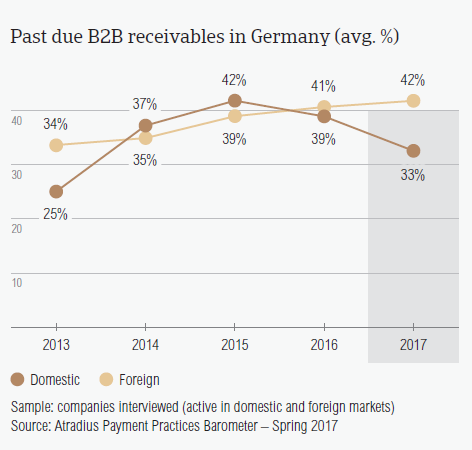 This means that it takes German respondents, on average, 45 days from invoicing to convert overdue B2B receivables into cash (five days longer than in 2016). Like in other Western European countries, liquidity issues of the customer is the main reason reported by German respondents for late payment of invoices. There was however a decrease in the percentages of respondents who reported this reason. In 2017 the percentage of respondents experiencing late payments due to liquidity issues of customers decreased to 45.8% for domestic (2016: 50.5%) and 37.8% for foreign (2016: 45.5%) invoices. Late payment of domestic B2B invoices because of liquidity issues in Germany (45.8%) was reported less often than in Western Europe (52.6%). In contrast, payment delays by foreign customers due to this reason were reported more often in Germany (37.8%) than in Western Europe (34.5%). Another key payment delay factor by domestic B2B customers in Germany was the buyers’ use of outstanding invoices as a form of financing (cited by 27.3% of respondents). Foreign B2B customers seem to also delay payments because of the complexity of the payment procedure (27.5%). 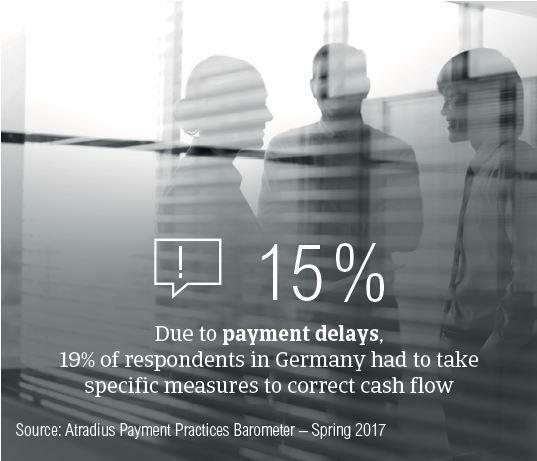 As a result of late payment, 15% of respondents in Germany said they needed to take specific measures to correct cash flow. This compares to 18.1% at regional level. More respondents in Germany (22.9%) than in Western Europe (18.0%) said they will take more action to protect themselves against the potential impact of Brexit, the slowdown in Asia and the effects of US protectionism. 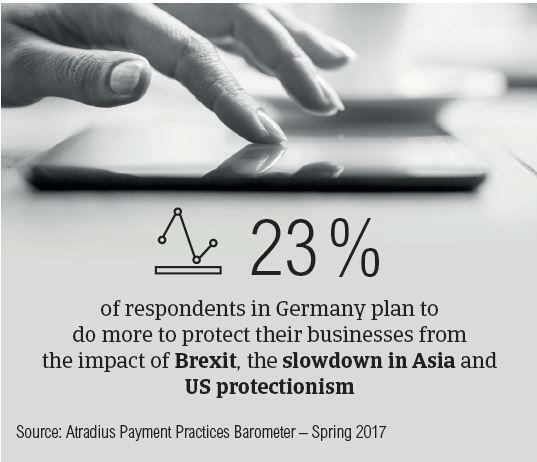 41.1% of respondents in Germany said they will not change their current credit management strategy to protect their businesses against the potential impact of Brexit, the slowdown in Asia and US protectionism. However, for 22.9% of respondents the uncertainty of these developments was reason to increase protection. Consistent with what was stated at regional level, the preferred actions by German respondents are checks on buyers’ creditworthiness (29.3%) and monitoring their buyers’ credit risk (25.3%). 21.4% stated that they will increase their use of credit insurance. To protect themselves against the impact of Brexit, respondents in Germany said they will increase their usage of credit insurance (21.9%) and check buyers’ creditworthiness more often (29.7%). To protect themselves against payment defaults stemming from the two developments outside Europe, German respondents said they will increase checks on buyers’ creditworthiness (impact of US protectionism 30.9%; impact of slowdown in Asia 27.2%) and monitor buyers’ credit risk more (impact of US protectionism: 27.7%; impact of slowdown in Asia: 22.9%). The proportion of B2B receivables reported by suppliers in Germany as being written off as uncollectable (0.4% of the total value of B2B receivables) is below the overall average for Western Europe (0.65%). Domestic receivables were written off as uncollectable three times as often as foreign ones (domestic 0.6%, foreign 0.2%). 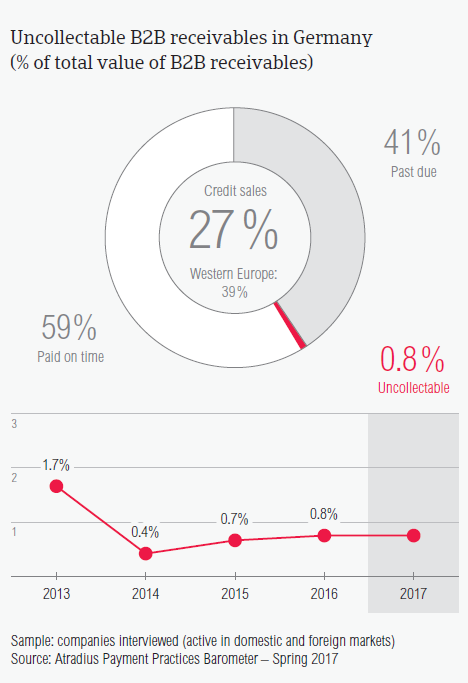 This was under the percentages of uncollectable receivables in Western Europe overall (domestic 1%, foreign 0.3%). The 2017 percentages of uncollectables are the same as those reported in 2016 (domestic: 0.6%; foreign: 0.2%). B2B receivables were reported to be uncollectable mainly because the customer went bankrupt (63.7%) or because the debt was too old (18.8%). Almost three times as many respondents in Germany expect a deterioration (27%) than an improvement (9%) in the payment behaviour of their B2B customers over the next 12 months. German respondents required B2B customers in most industries covered in our survey to pay their invoices within 24 days. Longer payment terms were given to B2B customers in the food (31 days), construction materials and agriculture sectors (30 days each). The shortest payment terms were given to B2B customers in services (17 days) and financial services (19 days). 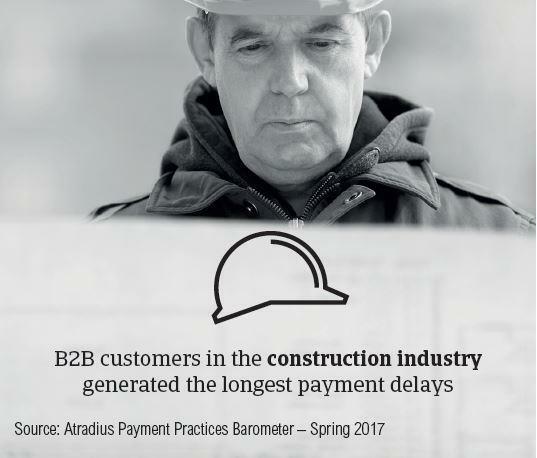 The construction industry generated the longest payment delays. According to most of the respondents (47%), this was mainly due to B2B buyers from this industry using outstanding invoices as a form of financing. 28% of respondents (second most) cited disputes over the quality of goods and services provided as a reason for payment delay. Looking ahead, 61% of respondents in Germany said that they do not expect a change in the payment behaviour of their B2B customers over the coming 12 months (56.8% of respondents in Western Europe). 27% of respondents believe that payment behaviour might worsen and 9% that it might improve.